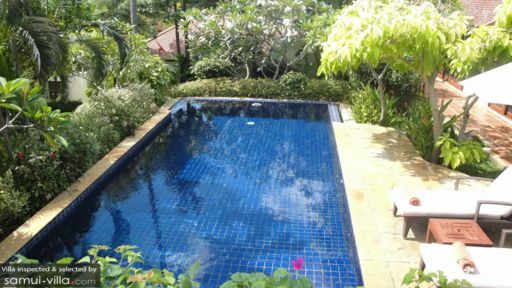 Part of the Samui Summit Estate, Tangmo Villa in Choeng Mon beach, near Bo Phut, is a tropical paradise with trees fringing its periphery, lush, verdant gardens bordering the main buildings, and a swimming pool residing in the midst of it all. 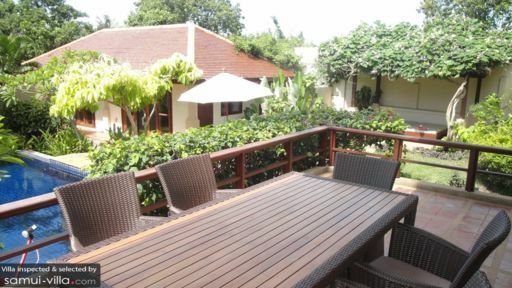 There are three-bedrooms in the villa, each opening out to the views of the garden and pool. The villa is traditionally decorated with calming colors, comfortable sitting, and Thai interiors. For a relaxing and rejuvenating vacation with friends or family, this is the right place to be! Three, well-furnished bedrooms with air-conditioning are all prepared for you to have the most restful sleep amidst the tranquility of Samui’s many beaches. 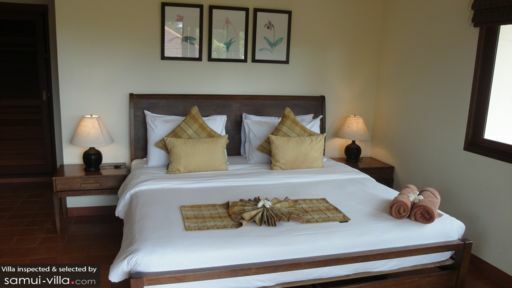 The master bedroom is furnished with a double bed and offers views of the swimming pool. It has a partially, open-air en-suite bathroom with a tropical shower. The two remaining bedrooms are furnished with a double bed and single beds, respectively. They both have en-suite bathrooms with tropical showers for a truly authentic experience. A lavish 10-metre swimming pool takes up an entire chunk of the gardens at Tangmo Villa with a pool deck furnished with several sun chairs for sunbathing and lounging, in-between swims and dips. Indulge in watersports with a volley ball or splash around with your family and friends so you can enjoy a nice time with those you love. The area is flush with greenery and a sweet fragrance of freshly-cut grass. A terrace comprises an alfresco dining area for guests to enjoy a spot of tea, breakfast, or snack in the open air with a ravishing view of the island! The poolside living area is designed in a traditional and vintage manner with muted colors to keep it inviting and cozy. It is air-conditioned so you can alternate between the warm outdoors with a cooler indoor situation. The room is furnished with comfortable sofas and other sitting options so everyone can rest together, watch some television, read, nap or play a game or two! The walls are decorated with selective artwork and the glass walls and doors keep the room airy and naturally lit. The dining table is appropriate for six, and the alfresco dining is also accessible out on the terrace. Enjoy a piping hot meal, that you could prepare yourself or request the chef to prepare for you. The kitchen is fully-equipped with all amenities and appliances for your ease, so you can get cooking without an issue. The island counter is comfortably situated so that you can make the most use out of it. The friendly staff at Tangmo Villa is experienced in catering to guests and their needs, so you won’t have anything to worry about. There is a tennis court where you can play endless matches, giving your best grunt! A daily breakfast is provided to guests, for a great start to their bangin’ day! The villa is located in an ideal spot on Choeng Mon beach, which puts you close to Bo Phut, where you can go view the Big Buddha statue. Explore the Choeng Mon Night Market, where you can shop for local finds, eat Thai food, and have a nice time. Chaweng beach is nearby as well, which is popular for its nightlife considering the many restaurants and beach clubs in the area.